View the full schedule (and it’s a JPEG so save it to your camera roll!) of all the fun activities that happened. Want to win a signed football jersey? Here’s how: Get a punch card. First available at the Powderpuff Game. Just three punches and you’re entered to win. Other punch-ortunities (like opportunities, get it?) are Homecoming Dinner at Chase, Blood Drive and the Tailgate. Winner drawn during the Tailgate on Friday, Nov. 2. Winner must be present to get your prize. Do you want to Celebrate Carolina year round? 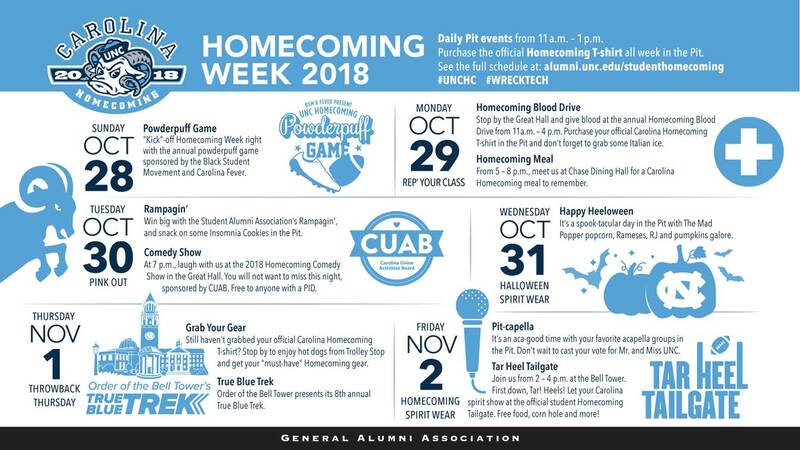 Join the Homecoming Committee and celebrate the greatest Carolina tradition. The Homecoming Committee is comprised of a small group of qualified, dedicated and enthusiastic campus leaders behind the largest tradition on campus. This committee embodies school spirit and significant leadership, making it one of the premier student leader opportunities on campus. Celebrate Carolina and what it means to you. Lead a team of dedicated Tar Heels as they plan Homecoming Week. Connect with thousands of students and alumni. Foster alliances with the vast Carolina Community. Learn more, and apply today. By crowning Mr. and Miss UNC, the student body votes to showcase two seniors, who exemplify scholarship, leadership and service – the pillars of the Carolina Way. The “Royals” then complete a self-generated service project in which they based their election platform upon. The projects, funded by the General Alumni Association, will work to better the University and the greater Chapel Hill-Carrboro community. Mr. & Miss UNC interest meetings for Fall 2018 will be held Monday, Sept. 10 at 7:00 p.m. in the Church Lobby of the George Watts Hill Alumni Center and Tuesday Sept. 25 at 7:00 p.m. in the Strayhorn Conference Room of the George Watts Hill Alumni Center. Due to Hurricane Florence, the application deadline has been extended to Wednesday Oct. 3rd at 5PM. Have more questions? Email your Royalty Chair Calia Johnson at caliamj@live.unc.edu. Student Organizations, it wouldn’t be the same without you. Have an event during Homecoming Week? We are always looking to promote activities that provide campus-wide engagement and show that signature Carolina spirit. The Homecoming Committee is also excited to partner with organizations around campus to ensure Homecoming is meaningful to all Tar Heels. Contact Homecoming Committee President Hayden Huffman at hayhuff@live.unc.edu to collaborate.